Here’s a deck that’s been taking the Tarot world by storm: the Tarot Illuminati by Erik C. Dunne. The great news is that this deck is now in production, and is due for release on May 8th, 2013, by Lo Scarabeo. It will come in a 78-card deck and book set, with 160-page companion book by Kim Huggens. You can pre-order the Tarot Illuminati at Amazon, or via the Lo Scarabeo and Llewellyn websites. There will also be an extended companion workbook to the Tarot Illuminati released by Llewellyn in 2013. 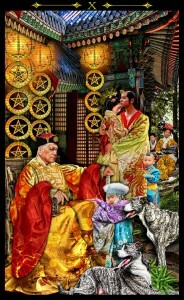 You can check out more of the artwork at the Tarot Illuminati Facebook page. Here we have the passive feminine (as opposed to the Empress’ active feminine), complete receptive and silent. The High Priestess forms a complement with the Hierophant, she representing inner wisdom, and he representing received wisdom. Together they present to us two equally useful modes of learning and understanding. 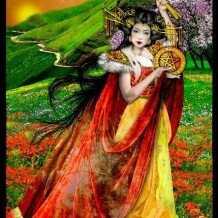 It is this card that has become the “cover girl” for the Tarot Illuminati, and which gives a wonderful insight into the style of this beautiful deck. 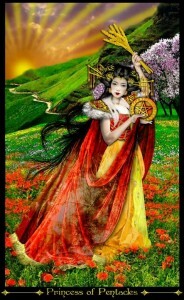 Earth, being the lowest and most manifest of the four elements, may at times be seen as less interesting or disconnected from the spiritual plane, and thus the Princess of Pentacles may also seem like the lowest manifestation of energy in the Tarot. However, Earth is fertile and fruitful, it provides us with all of our sustenance, a foundation for our lives, and it is in the plane of Earth that we grow. 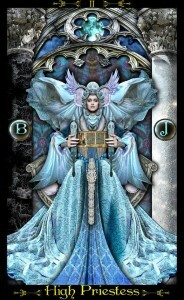 Thus, although the Princess of Pentacles is, indeed, the lowest of the cards of the Tarot, she is also the most fertile. All the energy of manifestation has fallen into this card, and now it lies within the belly of the Princess, who will bring it to birth. Essentially, in this card we find rebirth for the Tarot itself, as we can imagine that each card is contained within the Princess’ womb, just as all the seeds of life are contained within the earth. 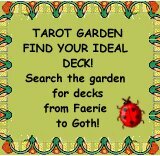 Twenty Five years ago, Erik discovered the art of Tarot quite by chance and thus began a journey that would inevitably result in the creation of his own deck, the Tarot Illuminati. Although he presently resides in the United States, he has traveled extensively Abroad and actually lived for some years in the Middle East. He has retraced the footsteps of legendary kings and queens, ridden camels across the dunes of Persia and galloped heavy steeds across fields of gold. His diverse life experiences are matched only by his opulent imagination, both of which are apparent in his artful creation of a cast of rich characters and fantastical realms. Although a classically trained artist, his medium of choice is digital, where he has allowed his passion for costume design and his roots in the theater to lend their resounding voice to each and every card of the Tarot Illuminati. Erik is presently a freelance graphic artist working on diverse commissioned projects, and has recently begun work on a much anticipated sister deck to the Illuminati, loosely based on the translations of ancient Sumerian texts.